Would coverage of a modern motor show be complete without Toyota’s ever tantalizing FT-86? Impossible. Here, then, is the car in its latest state as a FT-86 II — colored red. It’s pretty and, of course, it’s still not real. 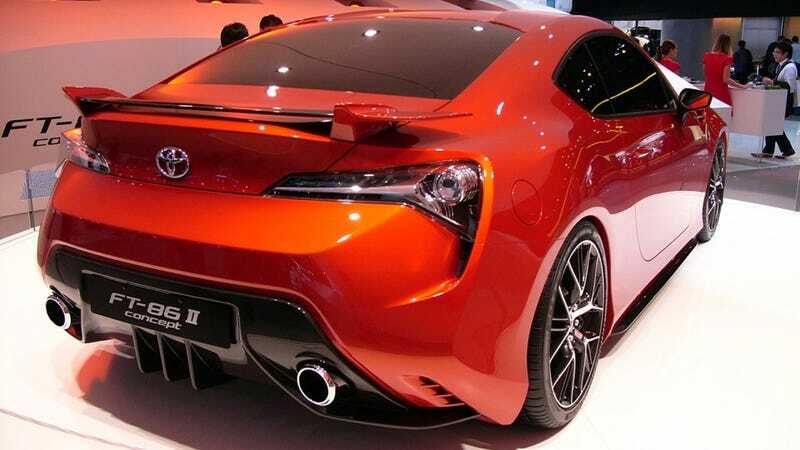 Toyota FT-86 II Concept: Oh, what a Supra feeling! It’s bewildering to think that I first saw a Japanese magazine render of the FT-86 in 2007. It is as if Toyota has invented glacial time and the idea of the permanent concept car. The FT-86 is still small, still gorgeous and still appetizing, and I don’t even own a tricked-to-Japan-and-back AE86 like my friend Nino Karotta does. Speaking of which, the AE86 must have spawned the strangest car subculture. Based on a car which is approaching classic age but which is meant to be driven to death, its successor visualized, defined, built, exhibited—but never produced. Meanwhile, AE86 owners fight their desperate fights against corrosion and metal fatigue. Perhaps the plan with the FT-86 is to leave it in permanent beta, to develop a version for every major auto show, until every AE86 owner dies of sadness. A strange way to make cars, but hey, it’s certainly a revolution of sorts.